Biography Synopsis: Zanddervon Beliah (Bela) Lamb was born in Page County, Virginia. He as known as “Bealy” or “Belie” (pronounced Bee-Lee), but Okeh Records gave his name as Bela Lam, a surname spelling now in use by his descendents. He married Rose Meadows, also a county native, and they lived in Jollet Hollow on Naked Mountain where they reared a son, Alva. After the mill where Bealy worked closed, the family moved over the Blue Ridge Mountains into neighboring Greene County. It was there, with Rose’s brother Paul, that they would remain, farming and raising livestock. Bealy organized the family into a quartet and eventually the family began playing various public occasions: Sunday schools, church gatherings, revivals and other local events. Around 1925, John Evans of Elkton, Virginia, noticed Bela Lam and his Family. He informed Okeh Records of their unique talent and the company contracted the singers to make six recordings. Okeh brought them up to New York in 1927 and paid all their expenses, plus fifty dollars for each of the six recordings. 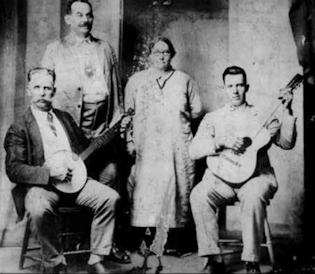 Okeh dubbed them “Bela Lam and the Greene County Singers.” Although Lam would not become a household name like Carter or Stoneman, the Greene County Singers were popular in their area of the state. In fact , they would record again with Okeh Records in the 1929 Richmond Sessions. Bela Lam and The Greene County Singers sang four-part harmony. Bela played banjo and Alva the Guitar; all four members sang. Alva sang the tenor melody while Rose sang a higher alto harmony. Bela and Paul sang bass. 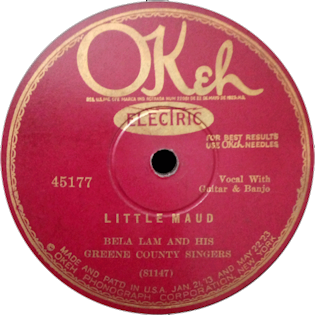 Both harmonies and lyrical content of the Lam’s music came out of local religious traditions. The shape-note system of harmony of the valley was highly influential; many of the churches in the surrounding area used shape-note hymnals. Biography Synopsis: Barershop quartet having W. C. Handy as a member for a short while. Biography Synopsis: Formed in the 1940s they wre well known for their traditional jubilee sound of fast tempos and four-part harmonies.